Once the necessary fingers work for touch typing technique is gained by mastering the keyboarding tutorials, it is time to take the next step. Choose one of our articles and practice it. 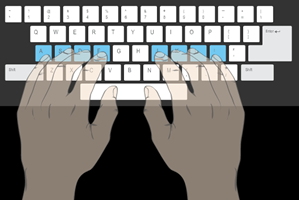 Animated keyboard layout and the typing tutor graphic hands are used to correct mis-typing by showing the right way to type for your learning and practice experience. When the session ends, you can learn a lot from the practice trends: WPM, accuracy and errors distribution. Take your time. Practice makes perfect. Follow carefully after the technique illustrated in the keyboard tutorials in order to gain the touch typing skill. Sit comfortably, preferably at a desk. Find a quiet spot where you can practice without distractions. Don't look at the keyboard - not even a snap peek! Made a mistake? No panic. Just hit the right key and move on. Later, spot the most recent mis-typed keys and practice it specifically.